Don't miss this trip through the movies that defined the ’80s era. 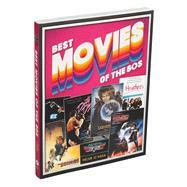 Packed with photos and memorabilia of Hollywood stars, this collection of classic cinema blockbusters offers summaries, release dates, trivia, and fun facts on each motion picture. We'll cover the invention of massive-budget action films, the Brat Pack, and even popular foreign flicks of the day. Nobody puts this book in the corner—you’ll be donning your Ray-Bans and immersing yourself in gnarly nostalgia from the neon-colored 1980s in no time!